My Bucks is the fully featured Starbucks client for Windows Phone which organizes everything you need at the Starbucks in an accessible way displaying the stores near by, your Starbucks rewards status, Starbucks cards and much more. Sign in to the My Bucks app using your Starbucks rewards account and download all your currently registered cards and can create the new account as well. Starbucks rewards account you are using unlocks the new method of payment at Starbucks, allowing you to track your Starbucks cards and scan it to pay- all while earning the stars in the starbucks rewards program. My Bucks is available in the Windows Store with the version number 1.0.0.1 and below are the list of features of My Bucks app. Well organized dashboard displaying the stores nearby, Starbucks cards and Starbucks rewards. Scan your device to pay at the participating Starbucks stores. Pay easily by just shaking your phone. Download the existing cards from the Starbucks rewards account. Add cards to your Starbucks account or register with the digital card. Earn stars and benefits, while enjoying your favorite Starbucks treats and beverages. 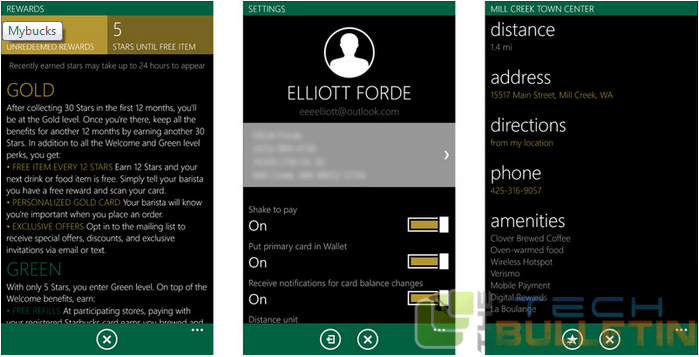 Keep track of your Starbucks through the Windows Phone’s wallet. You can’t add “reload cards” from the app, but this feature is expected to come in future update. You can easily add and manage your cards easily with My Bucks app for now and this app is also able to integrate with the Windows Phone wallet. It is very easy to pay for your drinks using the My Bucks app and you can add all your gift cards into single location on your device. My Bucks is available for free, but it is ad supported. To remove the apps you need to pay $0.99.